Blood remains outside Nettelhorst School after Monday's stabbing. 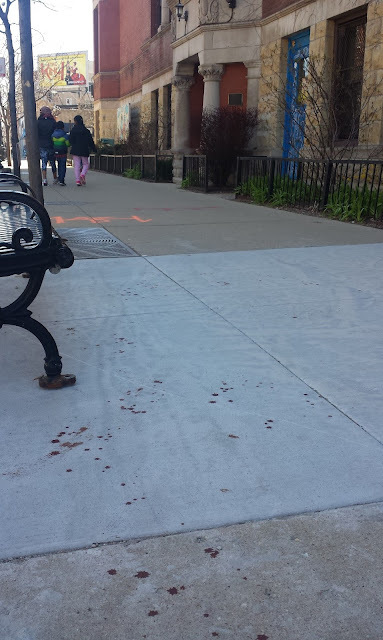 A witness to Monday afternoon’s stabbing in Boystown has emerged—along with photos of the victim’s blood still staining the sidewalk outside of Nettelhorst Elementary School, 3252 N. Broadway. The witness, who asked not to be identified, said she saw the attack unfold around 2:30PM. Police officers searched the area of Broadway and Melrose for a crime scene after the victim showed up at Presence St. Joseph Hospital, but they didn’t see any evidence of a stabbing. That’s because the stabbing actually happened at Broadway and Aldine on the north end of Nettelhorst School. As we reported this morning, a series of possibly-related incidents preceded the stabbing. • At 2:27PM, an officer on patrol was flagged down at Halsted and Aldine by a citizen who believed that they had just seen a person getting mugged or knocked out on the street. Everyone involved was last seen heading eastbound on Aldine toward Broadway in a black vehicle. The officer was unable to find the vehicle or anyone in distress. The bloodstains are located near a park bench across from Unabridged, the witness said. The victim, who was stabbed in the buttocks, has been released from the hospital.